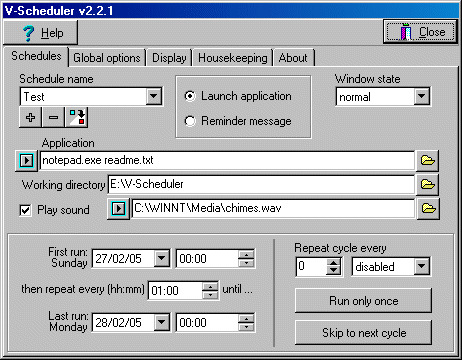 -Scheduler is a reminder and application launcher designed with total flexibility in mind. It consists of a highly intuitive user-interface and is extremely easy to configure. There is no limit to the number of schedules that can be programmed. Each schedule can have a unique sound inked to it so you know instantly when the time comes. In addition to the schedules you also have a small footprint clock which can sit anywhere on your desktop. The time and date format can be set to your own preferences. You can also automatically synchronize your system clock with any time server on the net. This means you never have to worry about your clock being wrong ever again.